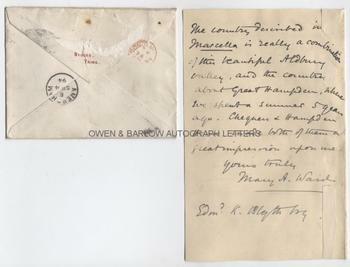 MRS HUMPHRY WARD Autograph Letter Signed. Mary Augusta Ward nee Arnold, known as Mrs Humphry Ward. Australian born British novelist and writer. ALS. 4pp, together with original envelope. Stocks, Tring. September 3rd 1894. To Edm[un]d K[ell] Blyth. 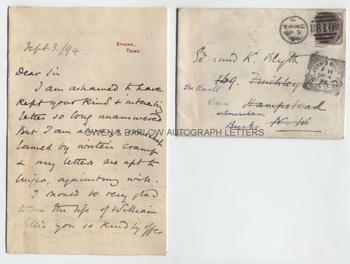 "I am ashamed to have kept your kind and interesting letter so long unanswered. But I am always somewhat lamed by writer's cramp and my letters are apt to linger, against my will. I should be very glad to see the Life of William Ellis you so kindly offer me, and have no doubt I should find it suggestive. My own belief is that upon the temper of the individual rich man depends at least half your problem. What we want to break down is the social arrogance of wealth and the sharp division it makes between classes. If pure collectivism is impossible and wealth and inequality must go on for the sake not of individuals primarily but of the community - as I for one believe - then our task is to moralise wealth, and to override the external inequality that must be, by a spiritual relation. Such a spiritual relation exists within the educated class, in spite of very great differences in outward possessions. What we want is to establish it between the hand-workers and other classes, and I see many practical ways to such an end, as yet untried. The country described in Marcella is really a combination of this beautiful Aldbury valley, and the country about Great Hampden, where we spent a summer 5 years ago. Chequers and Hampden House made both of them a great impression upon me. Yours truly"[etc]. 8vo. Approx 7 x 4.5 inches. Remains of old mounting hinges to right margin of last leaf. One short tear along head of central fold. All else fine. The envelope has some mounting damage to verso but is otherwise in near fine condition. Mary Augusta Ward, who wrote under the name of Mrs Humphry Ward was of a literary and intellectual family - her uncle was the poet Matthew Arnold and her grandfather was Thomas Arnold. Her sister was the mother of Aldous Huxley. Mrs Humphry Ward became one of the most popular of all Victorian novelists and her books sold in huge quantities. She was very prolific and it is, perhaps, no surprise that she should complain of 'writer's cramp' in this letter! In addition to her work as a novelist, Mrs Humphrey Ward was an educational and social reformer. She established an organisation for teaching the poor and adult education colleges. Mrs Humphry Ward stated her intention of bringing about "equalisation" in society and founded the Mary Ward Settlement with this avowed aim. Strangely, she was not in favour of women getting the vote and she was the founding president of the Women's Anti-Suffrage League. During WW1 Mrs Humphry Ward was asked by President Theodore Roosevelt to write a series of articles explaining the European war to the Americans. She threw herself into this with alacrity and made several visits to the front-line trenches on the Western Front. 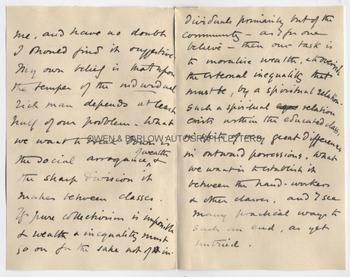 The reference to Marcella in the letter is to the title of her 1894 novel, which was based on her own schooldays. Edmund Kell Blyth was a London solicitor and the author of a biography of Dr William Ellis, the economist, educational thinker and founder of the Birkbeck Schools.